Argentinian by birth, although mainly lived in England. Born 28 September 1907 in Buenos Aires, Argentina, the daughter of British nationals. She came from a very large family and this probably gave her the experience to write about the large groups of children which feature in many of her books. Attended college in London and trained and performed as an actress as well as writing quite a few children's books (including many pony stories) and plays. Her pony books are all lively and well-written with sympathetic characters. Nothing outstanding but good solid adventures nonetheless. Although written in a light often humourous tone, there are in fact some quite dark episodes in many of the books, including a few children who are very unhappy or are eaten up with jealousy (a recurring theme). The unusual and quirky illustrations by Violet Morgan are a perfect foil to the stories. Longish series about the Pentire family and their friends Vicky, Sandy and Pam, and their adventures, both horsy and non-horsy. The books have a varying degree of horsy content, some are more general adventures. 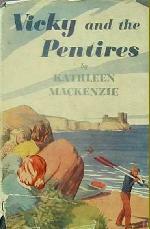 SUMMARY: We are introduced to the Pentire girls: Vivien, Frances, Sarah and Jane and their ponies. When two of their ponies go missing they set out to prove they were stolen, aided and abetted by young local boy Jimmy. SUMMARY: When their house is damaged by a storm the Penitre girls are thrilled to be allowed to go camping with 'Uncle Percy' an old friend of the family who is holidaying in a horse-drawn caravan. Whilst on their trip, they become involved with a young boy called Sandy who is trying to run away from his brutish step-father. As well as helping to re-unite Sandy with a much nicer guardian, they also join in an exciting hunt for some hidden treasures. Not much horse content in this episode of the series. SUMMARY: The Pentire girls get an unexpected Winter holiday when scarlet fever breaks out in their school and they are sent home. They decide to spend their time hunting and get involved with the new Master. SUMMARY: A story about new character, Vicky Quinion, who joins the Pentires for this and subsequent adventures. SUMMARY: Vicky joins up with the Pentire family, Sandy and Jim and Uncle Percy, as they go on a caravan holiday and get mixed up with a gang of dog thieves. SUMMARY: The Pentires rescue a chestnut horse trapped by the tide at the bottom of a cliff. They return the beautiful Red Conker to his master, an old man whom they befriend. But then they realise someone is trying to steal the horse from his devoted owner. No paperback editions as far as I know. These recently have seemed to become a lot harder to find, especially with their jackets. Red Conker is possibly the easiest to find of them and A Green Fox possibly the hardest. All titles hard to find outside of the UK. SUMMARY: Minda joins the local pony club and soon becomes it's star rider. But the rich and spoilt Jill is envious of her success and sets out to make things as difficult as possible for her rival. SUMMARY: Jan takes a job looking after a wealthy family's horses and ends up helping their unhappy children to learn to ride better and have more fun. SUMMARY: The story of triplets Jenny, Janey and Ginny. Jenny is an expert rider and Janey a talented actress. Ginny however shines at neither skill, but it is up to her to help her two sisters achieve their dreams. SUMMARY: When tragedy strikes, Pippa has to learn to get on with other people who don't share her horsy interests. Can 'chalk and cheese' really mix? PONYMAD RATING: Unusual, some would say rather odd, horse story. Not a huge bundle of laughs either. SUMMARY: Orphaned Nancy has to live with her Uncle and disapproving Aunt. She longs to befriend the horsy Carr sisters, but her Aunt does not want her to mix with them. Then one day she rescues one of the Carrs' horses and, to her delight, they promise to teach her to ride. SUMMARY: Whilst her parents are away Tessa wins a pony in the village fair raffle! She uses her savings to stable the pony locally and keeps it a secret from her stuffy guardians, but what will happen when her none-too-rich parents return? And there are also the problems of a suspected jewel smuggler and a horse thief to contend with, not to mention her exciting new friendship with a top showjumper. Things are certainly not dull for Tessa! Sisters Veryan and Julie are to spend a holiday with their Aunt in France. Horse-mad Veryan befriends a French boy, Jean Pierre, and his pony. The children also get involved with a mysterious package which was given to them by a nun on the cross channel ferry. Intrigue turns to danger for Veryan and it is up to Jean Pierre and his pony to save her! PONYMAD RATING: Decent read though only a slight pony element. More of a general adventure story. SUMMARY: Pony story set in Cornwall. Brother and sister Tamsin and John are staying with their Grandmother whilst their parents are away. John is recovering from an illness and is not allowed to walk very far and Tamsin has the idea of using Balaam, her gran's donkey to pull a cart so John can get around and explore the countryside. But Balaam proves too stubborn and the children pool their money together to hire a pony called Black-boy to pull the trap. The children have lots of fun and adventures in their trap but Tamsin can't help wishing she could afford to buy a saddle to ride Black-boy and she worries what will happen when their money runs out and they have to send their beloved pony back. SUMMARY: London-bred Della is dismayed when she has to stay in the country with her horse-mad cousins when her parents are abroad. But then the village pageant provides a shared interest which brings them together. PONYMAD VIEW: A light-hearted read, perhaps the most humourous and least down beat of her novels. Based in part on a real life event as the author used her real life experience of organising a pageant in Cornwall as a basis for the story. As far as I know no paperback editions were ever printed. In general, most titles are easier to find than the Pentires series, although slightly harder to find with jackets. The Cave in the Cliff, Prize Pony and Nigel Rides Away are probably the easiest to find. For American collectors, some of the titles are very hard to find there and can be expensive.